Coach Fox was unsure if Miller remains in jeopardy of losing his leg, though amputation appears unlikely because he received immediate attention. Zach Miller of the Chicago Bears is carted off the field after sustaining an injury during the third quarter of their NFL game against the New Orleans Saints at the Mercedes-Benz Superdome in New Orleans, Louisiana, on October 29, 2017. 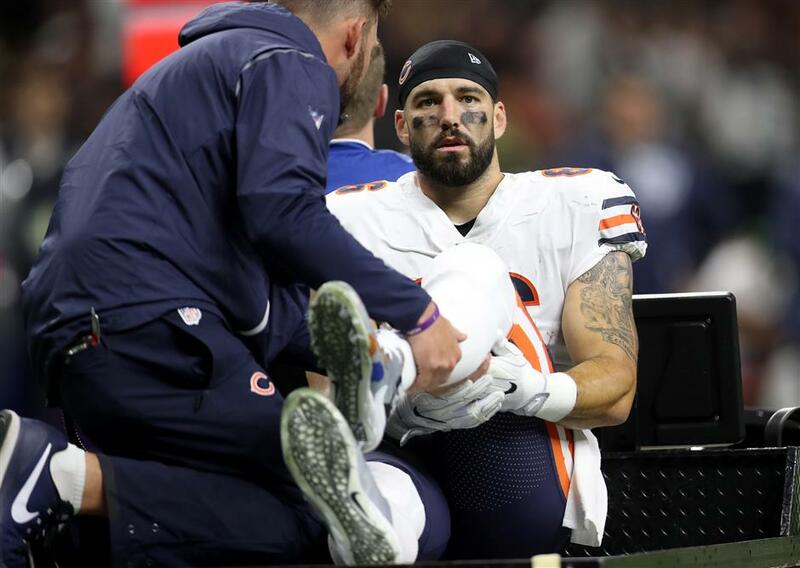 Chicago Bears tight end Zach Miller had surgery to save his left leg after he tore an artery while dislocating his knee during Sunday's loss at New Orleans. The team said the "urgent" operation on Sunday to repair a torn popliteal artery was successful. Miller remains at University Medical Center New Orleans, with team medical personnel and his wife and father by his side, after suffering a career-threatening injury. Coach John Fox said on Monday a vein was taken from the right leg to fix his left one. He said the pulse in Miller's lower leg was good and that he had feeling in his foot. "Not that he's out of the woods by any stretch but it's as good as could be expected at this point," Fox said. "If you don't have blood flow to the leg and it's been more than eight hours, you can have a likelihood of having to amputate the leg as high as 80-plus percent," said Dr Alexis Colvin, an orthopedic surgeon specializing in sports medicine at New York's Mount Sinai Hospital. "But in his (case), everything was very timely. Everyone saw it. The injury had immediate attention to it. It's pretty unlikely." She said it's "almost a certainty" Miller has torn ligaments. But the blood vessel is the more immediate priority. Doctors need to make sure the leg is getting the proper blood flow. Clotting is a concern, as is damage to the peroneal nerve — which provides sensation and motor function to the lower leg. "It's not a question of if he does, it's a question of how many," Colvin said. She said the anterior cruciate and posterior cruciate ligaments are most likely to be torn in Miller's case. Colvin also said he likely will walk again because he received immediate treatment, though that largely hinges on the blood vessel healing. "I was talking to Kristen — his wife — and he basically snagged the phone from her," Fox said. "I was actually shocked to hear his voice because ... I wasn't there during the surgery, didn't know the recovery process. "But typical Zach, he was arguing about catch, no catch. But very supportive of the team. Very unselfish. That's just him, and it's genuine. It's real, and I just kind of shared that back. He's got all our love and prayers coming his way. He was basically telling us to hang in there. But that's him. That's just the kind of person he is and the kind of teammate he is."